It was the first time this has happened during our travels. 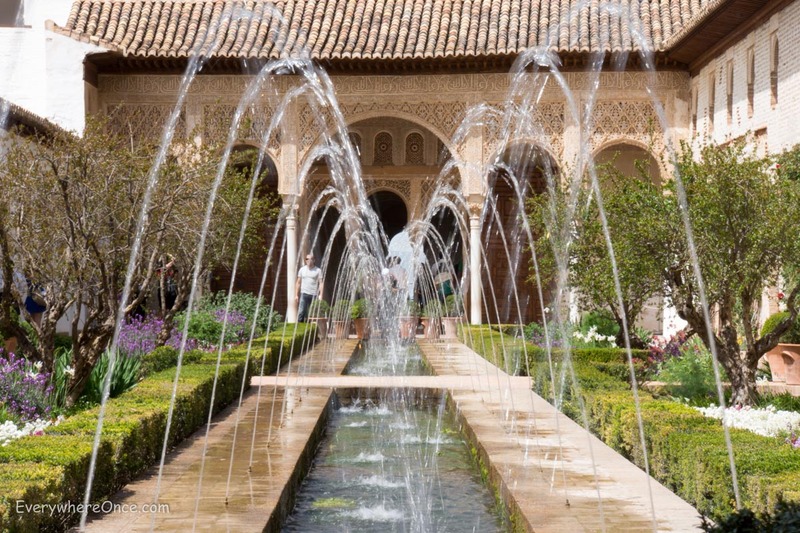 So enticed were we by the idea of visiting the Alhambra, a sprawling Moorish complex perched above the town of Granada, that we pre-booked tickets for not just one but two visits. When we debated where in continental Europe to begin our travels, an image of the Alhambra kept looming in my mind. And so we set out for Spain, beginning in Madrid and then traveling further south, steadily making our way to Granada. 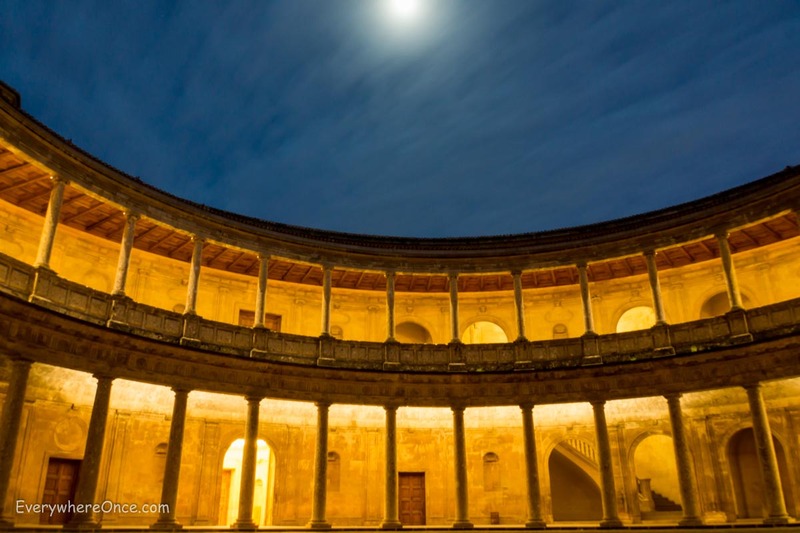 With such a weighty decision made because of a single site, it seemed only fitting that we do it justice by visiting twice to see the Alhambra in sunlight and moonlight. If a castle were super-sized, it would be the Alhambra. Rising out of a rocky hill and backed by the Sierra Nevada mountain range, the palace-fortress—parts of which have stood since the 9th century—is considered one of the greatest examples of Islamic architecture in Europe. 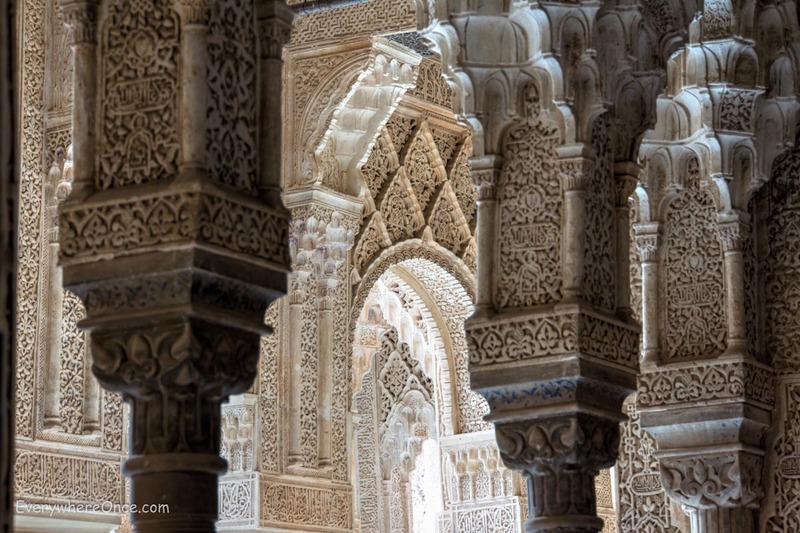 Like other places we’ve seen in Spain, such as Seville’s Alcazar and Cordoba’s Mezquita, the Alhambra is a fusion of Islamic and Christian influences, representative of the various powers-that-be that controlled it over the centuries. The Nasrid Palace was beautiful by day and even more magical after the sun set, partly because fewer people are allowed in for the nighttime viewing. Plus, if you’ve already visited during the day, you can bypass the crowds at the entrance and head to the best places for photos. 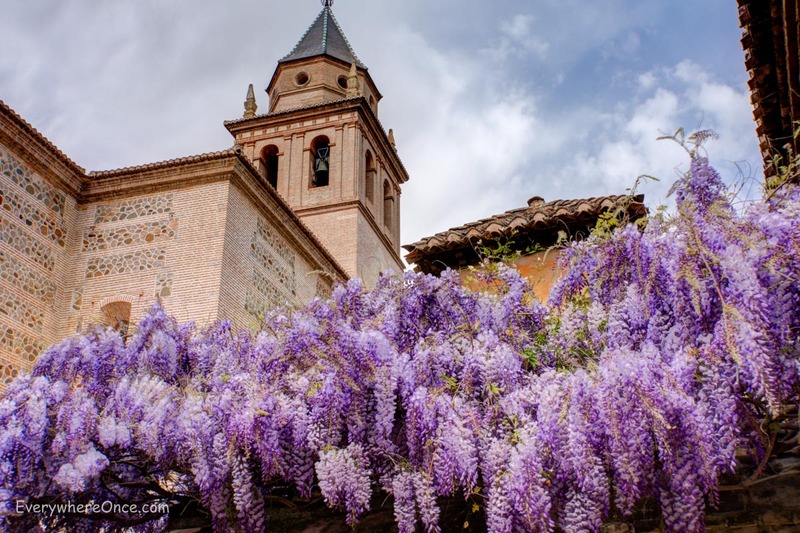 Like the conquering royal invaders Ferdinand and Isabella, who plotted to take control of Granada, including the Alhambra, it’s advisable to strategize a plan for visiting the attraction, which is one of the most popular tourist destinations in Spain. Tickets can be purchased on-site, but it’s best to buy them in advance as the number of visitors allowed into the Alhambra each day is regulated (alhambradegranada.org). Even two months before our visit, and in the off-season, ticket choices were slim. Entry is either at 9:00 a.m. or 2 p.m. and, in addition, a separate timed ticket is issued for the Nasrid Palace. Cost: 15,40 €. If your entry into the Nasrid Palace is at 7 p.m., skip the audio tour. We had to cut short our visit to the palace and make a mad dash to the front gate to return our audio guides by 8 p.m. or lose our deposit. 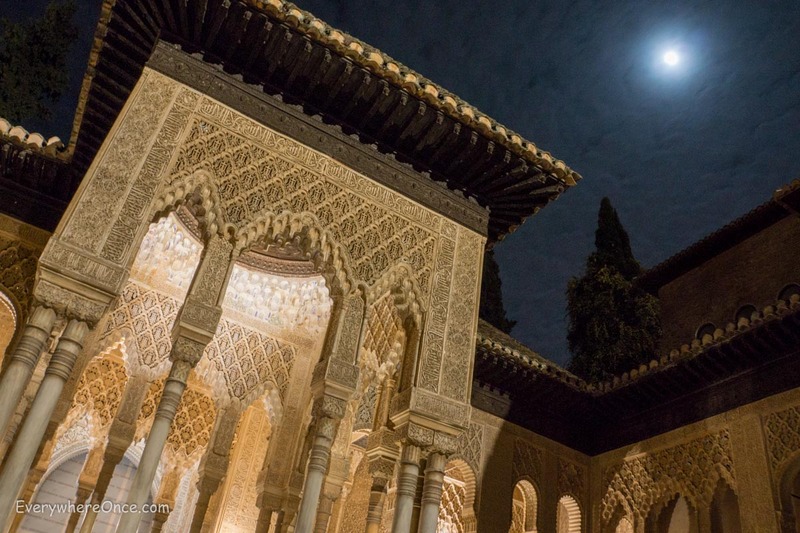 Nighttime entry into the Nasrid Palace requires separate admission with two times to choose from: 10 or 10:30 p.m. Cost: 9,40 €. 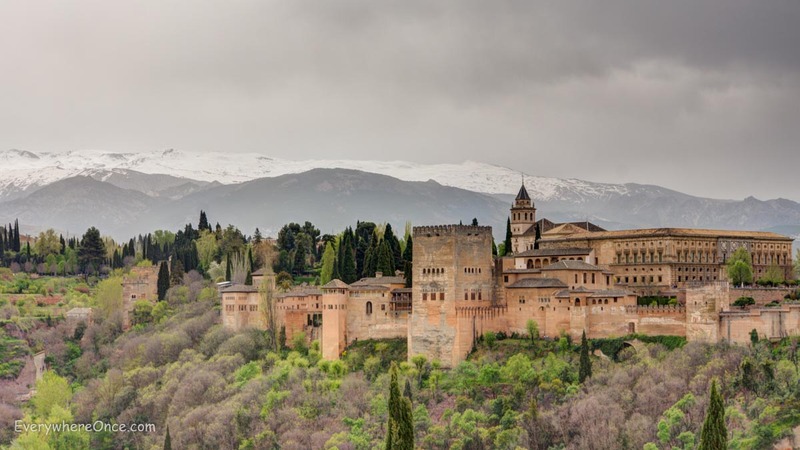 Allow several hours at the Alhambra, especially if you’d like to stop by the Fine Arts Museum in the Palace of Charles V. If you end up with extra time or need a break, there are places to enjoy a glass of beer or sangria while you let your imagination run wild. I just love the photos and they brought back some great memories. really beautiful photos! thanks for sharing! A castle from a romantic fantasy. That wisteria, the fountain, and the lacy architecture, all beautiful. You are my tour guides. One of my favorite souvenirs from the Alhambra is a set of three picture frames I bought there in the same beautiful mosaic work seen in the architecture. Stunning! Great photos! Were they with the now-dead camera? Glad you got to do the evening tour – isn’t that magical? Not sure I would call it the triumphalist Spanish palace built in the middle of those delicately decorated Islamic arches fusion architecture, though. More an omen of the expulsions ahead. Yup, those were taken with my old Nex 7. I’m not sure I could have gotten some of those with a point and shoot (that Nasrid at night photo in particular.) But we’ll see. I still haven’t committed to repurchase another large camera yet. I was there last summer. Wish I could have gone twice. We spent a good while there on the day we visited. It’s so pretty with so much to take in! Gorgeous photos! my parents raved about it! Me and a friend dipped behind a roped off area into the bathhouses near the end of the tour. It was transgressive and all, but a beautiful room. Evening over Grenada, when the moon is visible, looking down over the city, is just amazing. The Alhambra has been on my must-visit list for too long. Must. Visit. Soon.